The Makers Lab has been open for just over a year and we have already seen the UCSF community work on some incredibly innovative projects. Students, faculty, staff, researchers, and practitioners from all across the UCSF community come to the Makers Lab in the UCSF Library to unleash their natural creativity. As projects have become more complex and specialized, we have selected a few stories that we believe are in line with the mission of UCSF and the Library. These stories come from the three areas of UCSF: education, clinical, and research – let’s begin with education. Wes searches for 3D models of anatomy on the NIH 3D Print Exchange to use as partial-task trainers for simulation activities in the UCSF Kanbar Simulation Center. 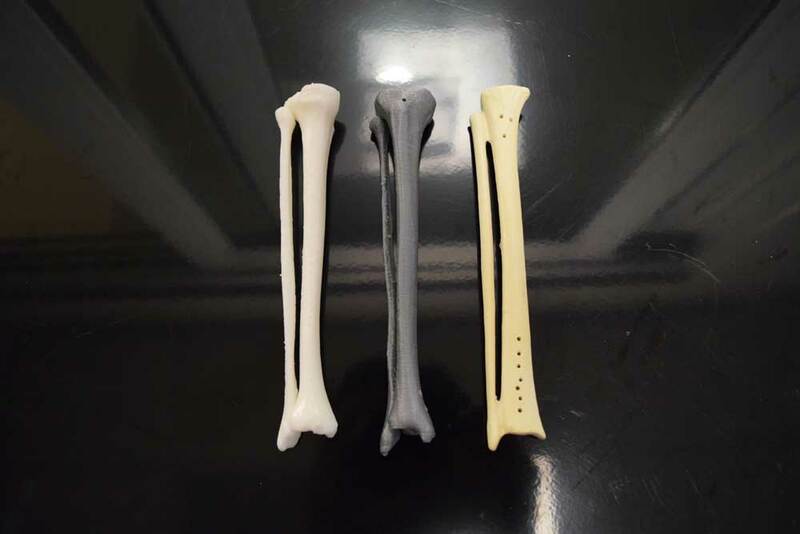 He 3D prints the partial-task trainer in the Makers Lab, such as a pediatric fibula and tibia model for simulation for 1st year medical students. The 3D printed fibula and tibia is designed to simulate the act of drilling into bone. 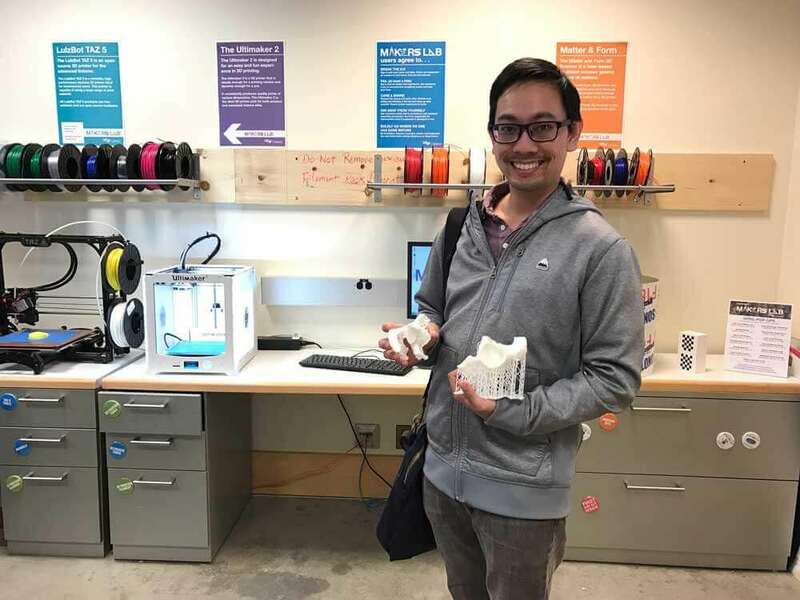 Manufacturing the partial task-trainer using 3D printing in the Makers Lab offers new opportunities to customize and manufacture learning tools right here at UCSF. The fibula and tibia partial task trainer costs between $30- $98 to purchase through a vendor, wears out after ten uses, and then must be replaced. A similar model can accomplish the same learning objective and cost less than $5 to manufacture right here at UCSF. Wes sees the value of replicating this approach to create additional partial-task trainers for simulation in the Kanbar Center and UCSF classroom. Dr. Dang converts DICOM files of complex fractures, acquired joint deformities, fracture malunions, and fracture non-unions to the STL format that are 3D printed on the Form 2, Lulzbot Taz 5, and Ultimaker 2 3D printers in the Makers Lab. Dr. Alexis Dang and Dr. Alan Dang have been using these models at the San Francisco VA Medical Center (SFVAMC) for surgery preparation and patient education. All of the full time UCSF Orthopaedic surgeons at the SFVAMC have also utilized anatomic models that were printed at the Makers Lab. In addition, Dr. Dang and the Makers Lab have provided a preop model for a UCSF Orthopaedic surgeon at Benioff Children’s Hospital Oakland. Dr. Dang’s workflow can be replicated in any discipline that has access to DICOM files and has a need for 3D visualization. The workflow can be used for patient education, simulation, 3D visualization, as well as provide cost savings opportunities. Stay tuned, as there is much more to come from Dr. Dang! 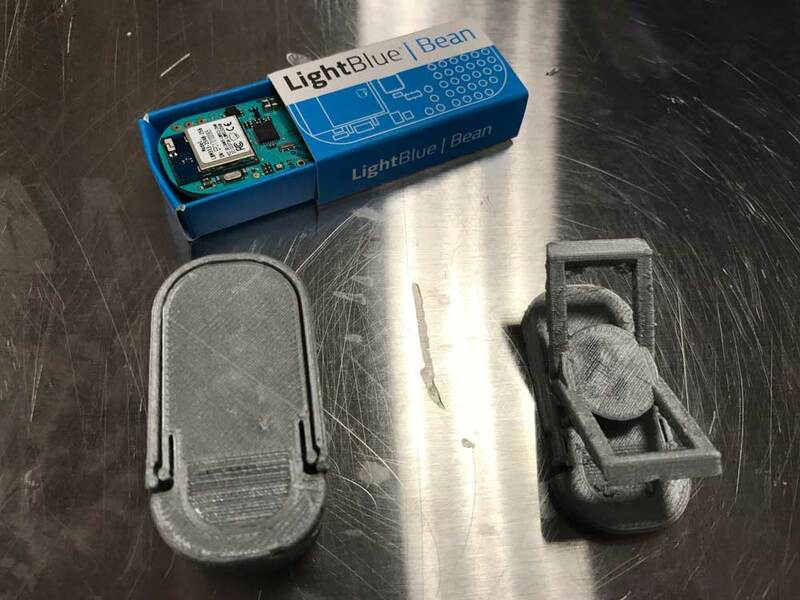 Dr. Weinstein designed and manufactured a wearable proximity sensor in the Makers Lab used to improve research into household air pollution from solid fuels. The wearable is a $35 device, made up of a combination of the LightBlue Bean and a 3D printed case. The purpose of Dr. Weinstein’s device is to track the location of a study participant at any given time. This allows Dr. Weintstein and fellow researchers to have a clearer understanding of what source of air pollution correlates with personal exposure from the data set. 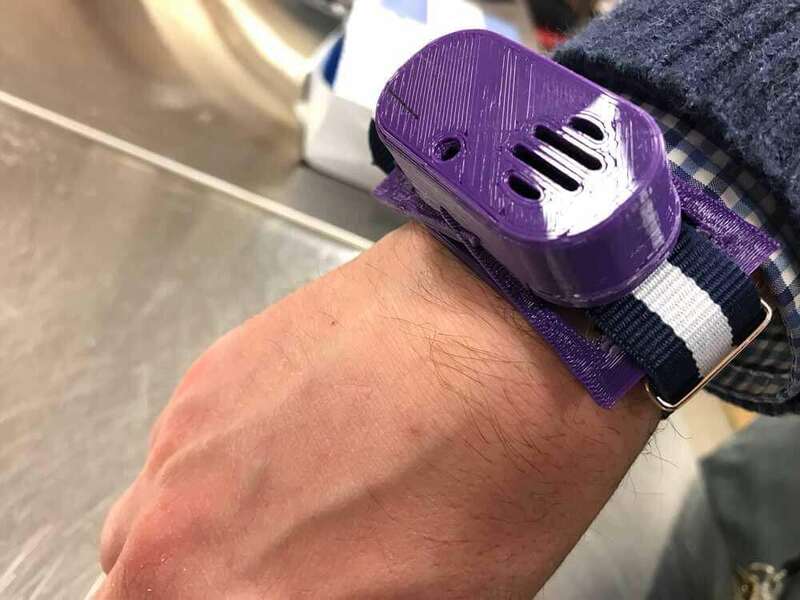 Early on, Dr. Weintstein identified the value of a low-cost sensor and proximity-reporting device that can be implemented as a wearable to reduce impediment and discomfort for the study participant. He continues to improve the device, test new materials, and looks forward to using it for his research later this year. Students from all across UCSF come to the Makers Lab for a number of reasons: to relax, brainstorm, collaborate with students from other professional schools, unleash their natural creativity, as well as discuss clinical and educational problems from multiple perspectives. 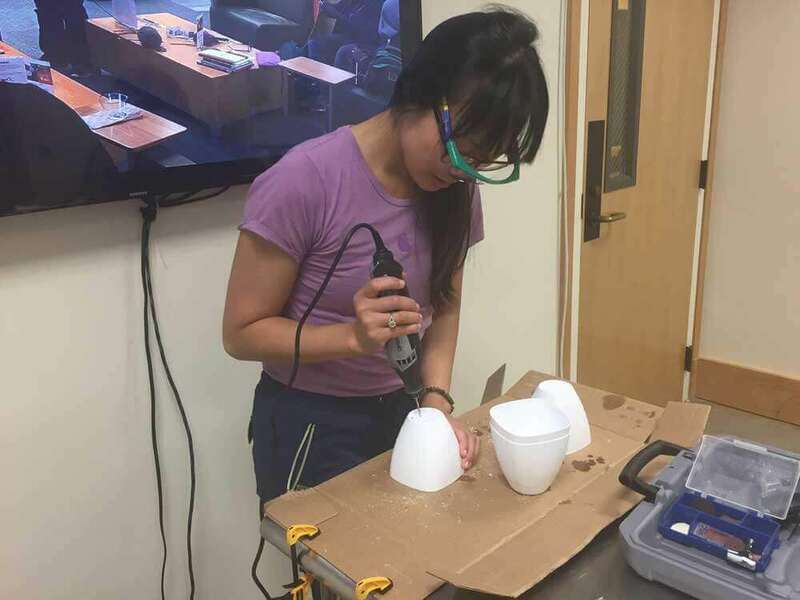 The physical space and equipment in the Makers Lab naturally leads to informal interprofessional learning opportunities outside of the classroom. Oh, and also a lot of fun and creativity (see video below of the DIY hologram created by School of Medicine student Parth Kumar)! Stay tuned, as the Makers Lab continues to grow and we document new and exciting use cases. Follow the Makers Lab on Twitter, Instagram, and Google Photos and send us your questions to makerslab@ucsf.edu.